Hello! 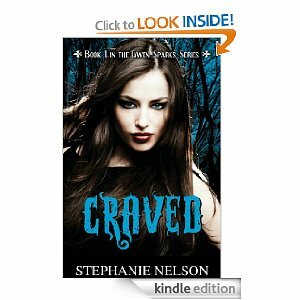 Today I am talking to the author of Craved, Stephanie Nelson. I read her book a few weeks back and loved it. If you like paranormal romance or just fun magical worlds you will love it too. Stephanie was kind enough to chat with me about her book last night (I do mean a literal chat) enjoy our sometimes tangenty talking. Liz Schulte- Hello, Stephanie Nelson! Liz- Stephanie is a friend from my writer's group who agreed to do this interview with me last night at 9:30 because I need a post for today. She is an awesome person and writer, but I will let her tell you about who she is. Stephanie- I'm a simple girl from Illinois where I live with my wonderful husband. A lot of people ask me if I always wanted to be a writer. The truth is, I hated reading when i was younger. I would occasionally read Goosebump books by R.L Stine but even those couldn't hold my interest for very long. Aside from writing notebooks full of poems, I disliked everything written. It wasn't until I picked up Twilight by Stephanie Meyer that I understood how someone could fall in love with a book. The Twilight sage ignited my love of books that quickly grew into an addiction. Before I had owned maybe two books, and now I own over 200. I have since moved on from sparkly fangless vampires but I will always be thankful to Mrs. Meyer for writing such an incredible series and instilling in me a love of books. Like every other addiction, mine grew. Reading countless books just wasn't enough for me, I needed to create my own. The story of Gwen formed in my head a little over 4 years ago but at the time the story was drastically different. The vampires still had an addiction for witches blood but I hadn't mastered what I was trying to say, so I gave up. Writing was a lot harder than I had imagined and I often grew frustrated and discouraged. I continued to write different stories, only to abandon them and start another. Eventually, I gave up all together. I was certain I couldn't become an author and that it was only a pipe dream. A year later, I sat at my computer and began to type again. I may have felt beaten by the writer's world but I was determined not to give up forever. I began writing a book and got to around 68,000 words (a normal novel is 80,000) and then the story of Gwen and the vampires who were addicted to witches blood, popped into my head and I gave up on my almost finished novel to write it. Craved was a story that was insistent and wouldn't leave me alone until I finished writing it. It took me 7 months to finish Craved and once I was done I was so proud of myself for actually completing a book. I didn't plan on publishing any of my work, i just wanted to write for the fun of it. It wasn't until H.P Mallory invited me to her writer's group and I started learning from fellow writers about self-publishing. I talked with my husband about publishing and he was gun-ho from the beginning. I, on the other hand, was as extremely nervous. I had put so much heart and work into finishing Craved. I worried no one would like it and was apprehensive about sharing my story with the entire world. I finally decided to publish in July 2011 and the acceptance that Craved has gotten is beyond anything I could have ever imagined. Praises from my readers is the best reward I could ever get and will be forever thankful for those who've supported it. While I'm not writing, which is hardly ever, I spend entirely too much time on Facebook, watch movies, try to read, play with my furry children, and spend time with my family. I'm a very down to earth girl who just happens to be living my dream. Liz- Please tell us about your book? Stephanie- Craved is about Gwen Sparks, a witch who is able to read the memories of the dead. She's unaware that the power has a darker meaning and is a learning a little about it as she goes. She reads a headline in the newspaper about a witch that was found drained and know's her power could help the local police in catching the murder, but that means having to work with her ex boyfriend, Micah, who dumped her for not being a wolf. Together they search for clues in finding out who is responsible and Gwen soon learns that witches are being drained for the magic in their blood--brew, as the vampires refer to it. She goes to Aiden Blake for help but ends up falling for his charm and becoming involved with the vampire who's been chasing her for the past 2 years. It's a mixture of suspense and romance. Liz- It is a very good description! I read it, I know. Have you always been interested in witchcraft or is this where the story took you? Stephanie- Yea, I've always been interested in witches. When I was younger I loved Hocus Pocus and Charmed. I just love the thought of magic, it's so much more interesting than the regular supernaturals in my opinion. When I began writing 4 years ago, I knew I wanted my lead character to be a witch with a rare power. Liz- I loved Charmed too! Who was your favorite? In your book the vampire, Aiden, is pretty wonderful--team vampire here--what was your biggest concern writing him? Liz-I completely agree! I talk about my characters like they are real because they do feel real which makes it hard to hurt them, but that's our job. Stephanie- Exactly, I'd love to write their lives where they live happily ever after, but life is dirty and people get hurt, Aiden and Gwen's lives are a little messier so it's hard to write that. Liz- It is a good for them, it makes them stronger. Ahaha that's how I justify it. This is the first book in a series. How many books are you planning in this world? Stephanie- I'm writing Hunted right now, which is the second book in the series and I already have the plot for the 3rd book, Coveted. But I haven't set a limit for how many will be in the series. When I'm done writing the 3rd I'm hoping another adventure pops into my head and I'll be able to write a 4th. Liz-Who do you think was the biggest influence on you taking up writing? Stephanie- It may sound strange but, Stephanie Meyer. I never liked reading and never understood how someone could be obsessed with a book. I bought Twilight on a whim, because even though I didn't like reading, I wanted to, so I still bought books here and there. I'd heard a lot about Twilight and gave it a shot. It was the first book I'd ever fallen in love with. After reading her saga, I went out and searched for more books. After falling in love with the paranormal romance genre, I knew I wanted to write my own story. The first 20 attempts were horrible and I gave up for almost a year, but the story wouldn't leave me alone so I continued to try and write it. Liz- That is awesome. I am not a Twilight fan, but if it could awaken that spark in you then that is wonderful. What was your biggest obstacle in completing Craved? Stephanie- Having confidence in my writing. I started around 20 different stories when I first started writing and always gave up on them because I thought my writing was horrible. My husband was the only one I'd ever let read my books and even though he said they were good, I thought he was just saying that because he's my husband lol. So when I got serious about finishing Craved, there were times where I'd leave it for a few weeks at a time because I thought I was kidding myself with wanting to become an author. I eventually gained confidence once I let my critique partners read it and that helped drive me to finish it. Liz-Well I am glad you did, your book was such a fun read! Liz- What is your favorite word? Liz-What is your least favorite word? Stephanie- When a man has confidence and knows what he wants, a great pair of eyes and lips don't hurt either. Liz- What turns you off? Liz- What sound or noise do you love? Liz- What sound or noise do you hate? Liz- What is your favorite curse word? Liz-What profession other than your own would you like to attempt? Liz-What profession would you not like to do? Liz- Last question, I hope the interview wasn't painful... If Heaven exists, what would you like to hear God say when you arrive at the Pearly Gates? Liz- Ahahaha! Love it. Thank you very much. Stephanie- Lol Thank you, that was a fun interview! Be sure to check out Stephanie's book Craved. You won't be disappointed. How cute and fun! Great interview! Fantastic interview, looking forward to your next book Stephanie. Loved reading Craved! So whatever happened to the book you were 68k into, Stephanie? Are we going to be seeing it anytime soon? Yea, Thanks for having me on Bat Country, Liz. The book that i had almost done is still sitting on my computer collecting virtual dust. I have thought about publishing it as a stand alone but I'm still not sure what i'm going to do with it. Great Interview!! I can not wait to read your next book! Wonderful interview! I just finished reading Craved and I must say I have fallen in love with Gwen and Aiden...I can't wait for Hunted!! !